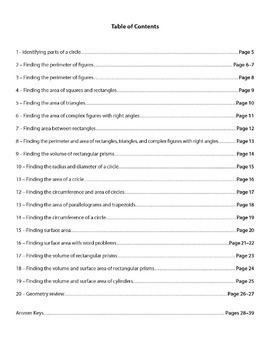 Do your students ever complete an entire worksheet, only to find that they have done most of the problems incorrectly and clearly have a misconception? 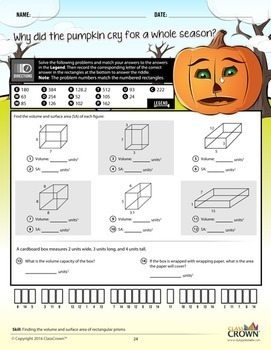 ClassCrown’s Riddle-Me-Worksheets help to prevent this problem by introducing a puzzle aspect to math, giving students immediate feedback as to whether or not they are solving problems correctly. If the answer to the riddle isn't correct, the student knows which problems he's made an error on. 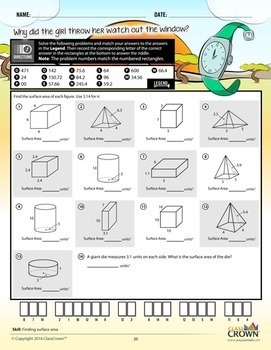 This geometry pack contains skills covered in grades 5-8. While some of the included skills may be advanced for a younger student, the more difficult pages can be used as enrichment for advanced students. Each page has been designed in full, vibrant color for maximum quality but has been engineered to look great when printed in black and white. 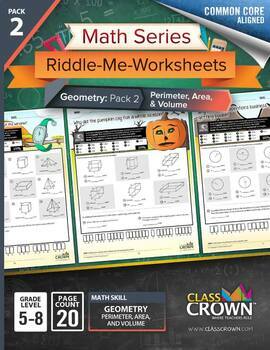 Click Here to read our Riddle-Me-Worksheets product blog post. Feel free to let us know how we're doing in the Ratings & Comments section. Also, check us out on the web at www.classcrown.com and don't forget to follow us on twitter for updates and teacher information. The content of this document is copyrighted by ClassCrown™. © 2016 ClassCrown. All Rights Reserved. Personal Use: With your purchase, you are being granted permission to copy and print the digital work. All copyrights remain with © 2016 ClassCrown.